What's next, now that the Splendid Sampler is over? Well, I'm assembling the quilts and have finished the tops of two of them, the Red-orange and the Green (Which makes me think... should I give them names, or just refer to them as the color? I do not know yet...). Since I started the TSS project to try to use up fabrics I did not want nor thought I'd use (EVER! ), I am using those fabrics for sashing and backing and binding, which limits my choices. But I am making it work. I think. For the Red-orange, I used a solid orange and a red floral for the sashing & border. I'll quilt the blocks individually and the stitch-in-the-ditch for the sashing. I've got enough red floral fabric to bind it and an off-white with red & yellow scattered flowers fabric to back it. My January UFO is finished. It's a quilt for my son who is a musician. The top is, at least, and that was my goal. I am working on quilting designs for it and will add it to my UFO list once I've decided how to quilt it. The Modern Quilt Along Challenge for February is MODERN TRADITIONALISM. The Modern Quilt Guild define it as, “the updating of classic quilt designs.” It’s basically taking the old and making it new again. Since I'm new to the Modern quilt, I'm starting small with small wall hangings. This month I'm working with a single Dresden Plate pattern. Since we had the great Snow Moon this month with an eclipse and the Comet 45P flyby, I've named it "Snow Moon." 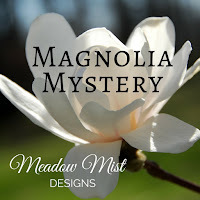 There is a great tutorial by Felice Regina of Sew Scatterbrained of a Full Moon quilt using a Dresden improv that was my inspiration for this quilt. I started with a single pale pink fabric for the Moon (that wonderful color the moon starts as at dusk), and was really pleased with the fact that it was flat once I completed sewing it together, but as soon as I added the center circle it reminded me of the rosette ribbons I've seen at the County Fair and could not un-see it! Augh! I spent 2 weeks looking at it sitting on a pile of fabrics, trying to see a moon and not a rosette, but it never happened. And the month is almost over! That was enough waiting--I dug through my whites and found 2 fabrics: a silver snowflake on white and a white-on-white tiny circle. I have 20 wedges cut out and ready for assembly. I'm attempting a Dresden like Felice's with no center circle this time--wish me luck! I have a dusky grey fabric for the background. And I'm considering an orange and a white for a low-horizon landscape feel, but that's still iffy. I have 3 days to complete it! 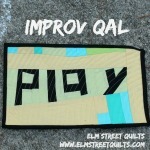 I've been playing along with Elm Street Quilts on the Improv QAL (sorry, no pictures yet). Two prompts have been given: wonky log cabin and triangles. I started with (you guessed it!) reject fabrics so I could get the feel of it. Then I went to fabrics I'd like to live with. I'm liking the play time! And the results! Give it a try--it's quite freeing.